Nothing sounds worse to compression wearers than the idea of wearing their compression garments during the hot summer months. Thankfully, Therafirm has several great options that make wearing compression not so bad – or perhaps even comfortably cool. And since many people wear compression due to medical necessity, this is truly good news indeed! So, what do we have? First things first – Therafirm has compression garments in many different lengths and styles. If your doctor gives you the okay, you can opt for a shorter style than you’re used to – like thigh highs instead of waist highs or knee highs instead of thigh highs. There is even an anklet available. The less skin that is covered, the easier it is to stay cool. 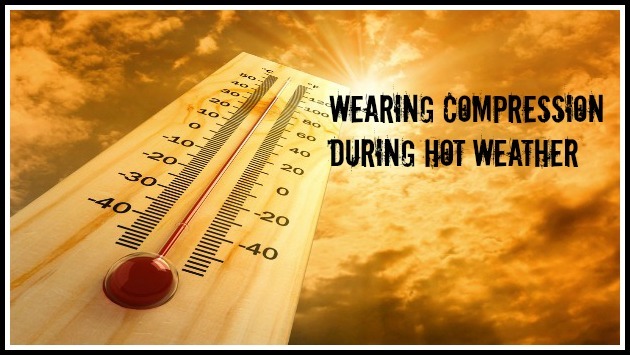 But, truly the best option for beating the heat while wearing your compression, is trying our Ease or Core-Spun brands. Both have properties that are designed to keep you comfortably cool. Ease by Therafirm compression legwear is made of super soft and more importantly breathable materials. The more breathable yarns help to keep you cool all day. Ease products also contain CoolMax® fibers which are moisture wicking keeping the garments dry and comfortable. Core-Spun by Therafirm is our casual line of compression legwear. Don’t let looks deceive you on these socks. The soft thickness of the sock material may make your feet sweat just looking at them, but they are specially designed to keep you cool. Core-Spun socks are made with Micro-Cool® and superior moisture wicking fibers, which pull moisture off the skin and to the outside of the garment where it dries. We all know the importance of following doctors’ orders to maintain good health. If your physician recommends compression legwear, look to Therafirm for compression legwear designed to keep you cool. Either that, or make plans to spend the summer touring Alaska!